You know— just the usual. But despite my overenthusiastic patriotism, I feel a little guilty. The thing is, I have a little secret. Okay okay, a terrifyingly big secret. I don’t like the most all-American thing of all. I don’t like apple pie. Now before you go shouting, “The horror! The horror!” and registering me as public enemy #1, allow me to explain. Pie and I are just friends who were never quite meant to be. I don’t like apples when they’re cooked and mushy. Ick. Pie crust, for all its flaky tenderness, is just a tad too buttery and plain for my liking. I love making pie, but eating it just doesn’t have the same appeal. However, spending my summer in Washington D.C. without a patriotic alternative is quite simply crazy talk. And speaking of crazy talk, I’m prepared to make a bold statement. What would you say if I told you that these summer shortcakes rock the red, white, and blue like a boss? If I told you that they use local, in-season produce? If I told you that they take less than 30 minutes to make? If I told you that these Red, White, And Blue(berry) Shortcakes trump silly ‘ole apple pie any day? You would say that I’m crazy. First, make the biscuits. Reheat oven to 450°F. In a large bowl whisk the flour, baking powder and salt together. Break the butter into small pieces the size of your pinky nail. Now, using your fingers, incorporate the butter into flour mixture. The resulting mixture should resemble coarse crumbles. Slowly drizzle the milk in, gently mixing until a dough is formed. Stop adding the milk once a soft, pliable dough is formed. Be careful to not make the dough too wet or dry. Knead the dough in the bowl 2 or 3 times, gently folding the dough over itself (important: this creates the fluffy biscuit layers!). Form a rough ball and then transfer to a lightly floured surface. Roll or pat out the dough until it’s 1/2 inch thick. Cut into 2 inch rounds with a biscuit or cookie cutter (I used a rimmed glass!). Make sure to push the cutter straight down and pull back up without twisting so that the biscuits will rise evenly. Place biscuits on a greased baking sheet. Bake in preheated oven for 10-12 minutes or until golden brown on top and a deeper golden brown on the bottom. While the biscuits are baking, prepare the summer berry compote. In a small pot, add the strawberries, blueberries, and blackberries to a small pot, along with the water and honey. Simmer berries over medium heat on the stove for about 8 minutes, stirring occasionally. After about 8 minutes, the berries should be soft and juicy, with a thin syrup. 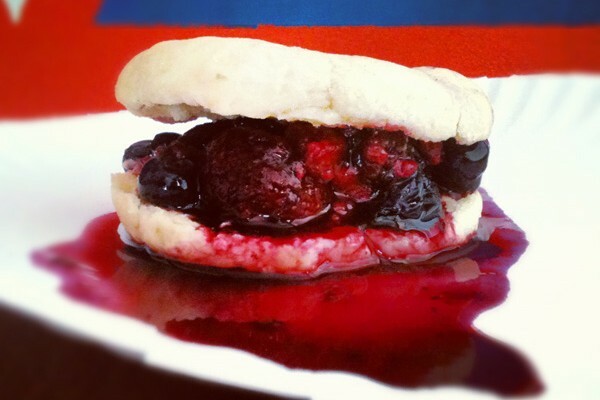 Split biscuit in half and spoon berries on top. Add whipped cream on top, if desired. Serve, and enjoy! Lexi Cotcamp is a soon-to-be sophomore studying business at Georgetown University in Washington D.C. With a penchant for ballads and barefoot treks, she’s spending summer 2012 purposefully getting lost in the urban heart of the nation. See more here. This looks lovely! Wishing you a happy 4th!